Water is leaking past a faulty seal and straight into the tail lights of roughly 360,000 Acura SUVs. From there it meets up with some electrical components and that never tends to go well. 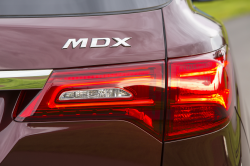 In this case, it’s shorting out internal and exterior lights in the 2014-2019 MDX and 2017-2019 MDX Sport Hybrid. Dealerships will replace the light assembly gaskets when the recall begins on April 29, 2019.